A. 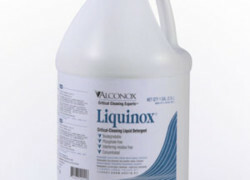 The recommendation would be to use 1-2% Liquinox® Critical Cleaning Liquid Detergent (a mild alkaline, emulsifying and dispersing cleaner) at a temperature well within the temperature tolerance of the plastic. Warm solutions clean faster than ambient temperature ones, so if some heat is an option, use it. 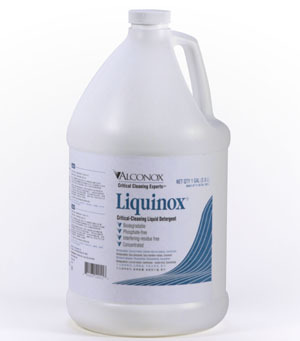 Liquinox detergent would not harm plastics other than possibly stressed polycarbonate where there is potential for stress cracking. Other plastics, including polyethylene, high density polypropylene, etc. are not expected to be any problem. As always, compatibility testing in your own setup, application and equipment is recommended. Stressed polycarbonate in the presence of heat and low surface tension solution (like a solvent or a detergent) will undergo stress cracking (fogging or crazing). It such cases we would go with Detojet® Low Foaming Liquid Detergent and further information can be accessed here.